“The two-day workshop aimed to equip the Regional Ecumenical Council in the Cordillera (RECCORD) in framing its own emergency preparedness and response plan following the localization agenda of NCCP in doing its humanitarian work. The formulated EPRP will then be used by the ecumenical council for emergency situations in the region,” said Ms. Minnie Anne Calub, the NCCP Program Secretary of Faith, Witness and Service (Development Unit). In partnership with RECCORD, the activity was a result of a series of consultations, seminars, and workshops on disaster risk reduction and management (DRRM) mainly focused on maximizing and preparing the member churches on its vital part in humanitarian response. “As one of NCCP’s commitments to the World Humanitarian Summit, the Council is drawing on the strengths and resources of local communities and churches in supporting communities to address their vulnerabilities, and strengthen their resiliency, self-reliance and collective action,” said Ms. Calub. “The churches are already there. They know their communities, and the communities know them. There is a great opportunity for the NCCP member churches in leading an emergency response,” Ms. Calub added. RECCORD reaffirmed and emphasized the urgent need for disaster preparedness in the region. “Besides the natural disasters we are facing such as typhoons, landslides, and floodings, our region is also facing alarming human-induced disasters such as militarization of communities and massive destruction of environment brought by foreign mining corporations,” said Ptr. Maricar Delfun, RECCORD coordinator. “These massive mining activities lead to the displacement of communities, health hazards, disruption of local economy, landslides, river siltation, destruction of watersheds, flooding in agricultural lands, among others,” Ptr. Delfun added. 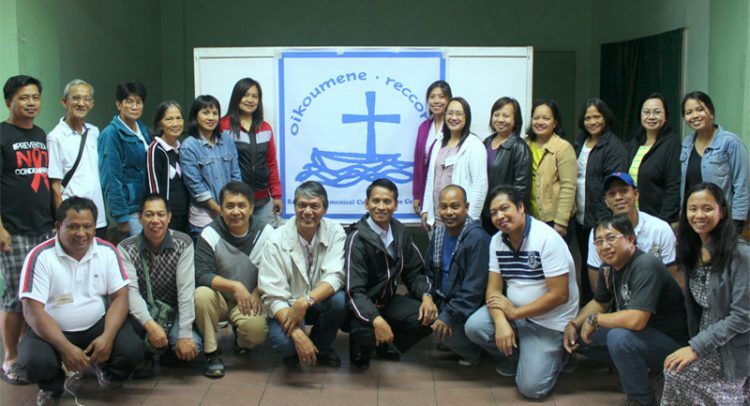 RECCORD committed on the challenge of forming up their ecumenical disaster risk reduction and management (EcuDRRM) team. “We have always been witnesses of different disasters in the Cordillera, from natural to human-induced. In this workshop, we have seen the opportunities present for us in responding to emergency situations. There is a clear urgency and need to form up a team that will be committed to such task. And RECCORD is very much willing to answer that call,” Ptr. Bill Mariano, a staff from RECCORD, ended. RECCORD is an ecumenical fellowship of Christian churches in the provinces of CAR including Abra, Apayao, Benguet, Ifugao, Kalinga, and Mountain Province. Among its members are the churches of IFI, ECP, LCP, UCCP, UMC, TSA, and IEMELIF.